Dodge has made some interesting special editions over the years, including the Dodge La Femme and Dodge Texan. One of the best was the Dodge Dude pickup truck of the early 1970s. I'd never heard of The Dude prior to researching Dodge D series special-edition trucks for the DOTS '78 Power Wagon earlier today, but it wasn't long before I came upon DodgeDude.com, a website devoted to the 1,500 to 2,000 Dudes built during the 1970 and 1971 model years. It goes without saying that Allpar would have extensive Dude info as well. 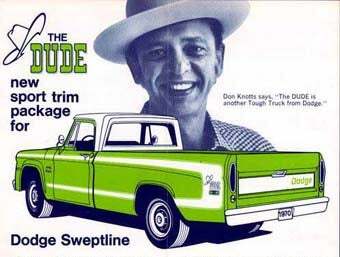 The Dude Sport Trim Package was available on Sweptlines in the United States and Canada (where it was sold as the Fargo Sweptline Dude) and included a special tailgate, bumblebee stripes, Dude emblems, and other goodies. Let the Big Lebowski jokes commence!